From $20. Ready in 1 - 2 day(s). Wholesale Discount We want to give makers and small businesses the best price to help their business grow. Available to selected makers and traders. Apply for your wholesale account. This Soft Chenille fabric is made of spun Chenille yarn using a tight traditional Chenille weave construct. This creates the classic chenille finish with a ‘caterpillar’ pile on the face of the fabric. We use poly fibers to create a thin warp and a thick weft. The fabric weighs 9.7oz , and its weight combined with the type of weave makes the material quite thick and reasonably heavy. Due to its strong base and tight weave, our custom made Poly Chenille fabric is very strong and durable. 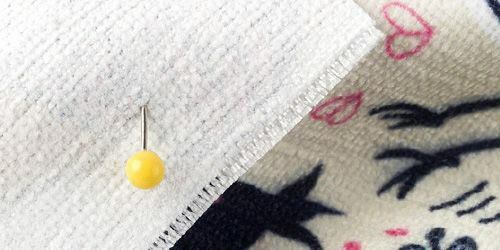 It is a water absorbent material, making it ideal for use in items like bathrobes and towels. Ready in 1 - 2 day(s). The custom print Chenille fabric is impressive because it's very thick and textured, but also has an off white base compared to the rest of it's siblings in the traditional weave category. This fabric is very soft, strong, and has a good drape. Other than a very slight give in the fabric, it is a taut material. The fabric is quite thick and heavy with a stiff element to it, giving it good body which is easily handled when being used. With an element of comfort from the surface texture, the custom printed Chenille fabric’s caterpillar pile has a very subtle yet busy surface. The base color has an off white, almost cream undertone. It is quite translucent when light is shone through it, and reflects light in interesting way as the surface of the textile allows the fibers to catch the light in unique ways. The texture in the fabric in no way interferes with the print, leaving very crisp high quality imagery that allows for fine lines. The soft durable qualities of this material make it great for a range of garments. It is a wonderful fabric for bathrobes due to its comfort and absorbency, with a classy finish. Chenille’s surface texture and durability also make it perfect for furniture upholstery. beautiful work I had a picture printed on velvet. The color looks great. Very professional. What Is Chenille Usually Used For? You have probably seen it most used in upholstery because it's thick textured fabric holds up well in everyday life. We have alternate textiles with similar properties, but it would be worth ordering the swatch pack if you are looking to upholster items in your home. Is This Similar to the Chain Jersey? The Chain is much more of a clothing material, with a stretch and soft texture on both sides. The Chenille, however. is much stronger and tougher fabric that can be used for longer lasting projects. If I Used This For a Detailed Image, Would It Show the Lines Perfectly? Now that you've chosen your custom fabric, you're hoping that the properties of the fabric won't affect the overall pattern. 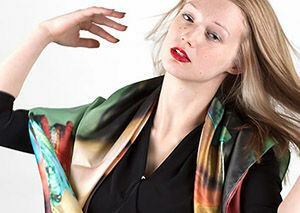 Your image will print beautifully onto this fabric, so don't worry. If you still aren't convinced, then please order a test print. We print your design and have it to you with a turnaround of 48 hours. You have the amazing designs, but do you have a unique range and place to sell? All you have to do is design what you love and we bring your creations to life. We take care of the hand crafting and manufacture, the sales and the shipping. You the designer, control the products and designs from wherever you are, from home, the office, even on the go. Meanwhile the orders start to roll in and you get commissions fast. What's the best resolution to print in? We print at 200dpi, which is a good combination of quality and file weight. Ideally, your image should be scaled to 100% at 200dpi; this means that no resizing of your file occurs, preventing any interpolation. Our design interface will have a quality marker next to the design that you have uploaded, this will change color using a traffic light system and display a message. The message will let you know if the resolution is too low or if you have a good quality image. How will my image scale? When you upload your design our system will automatically scale it to fit your chosen fabric dimensions. In the ‘Product Image’ tab, the displayed dimensions under ‘Print Size’ will show the dimensions of the piece of fabric that you are ordering. For image/design dimensions you need to see the ‘Images & Text Tools’ tab. You can see and edit the dimensions of the image under the quality information next to the thumbnail. Which color model should I choose? RGB or CMYK? If each individual color is specifically important to your design, choose CYMK as our setup will print each color with the closest possible match within our available range. If the relationship between the colors within the image is more important choose RGB; this will reduce all colors equally to fit within our range. For most of our fabrics there is no limit on the length of the fabric that you can order. We have a preview design window set up to 10 yds max to visualize the print, but that's not a print limit. If you'd like to order more, increase the quantity (x2 for 20 yds or x4 for 40 yds for e.g.) and then you can order as much as you'd like, with a built in automatic volume discount too. The maximum print width of each fabric can be found on the individual fabric pages or in our design interface. Do I need to incorporate white space within my design if I want a border or some cutting space? 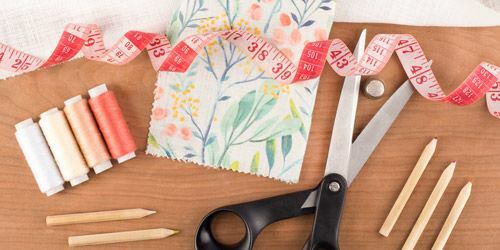 Yes, that might help you Always incorporate any extra space or borders into your purchased fabric size. We trim squarely around fabric samples and fabric prints, leaving approximately 0.22" white space. Cutting neatly on the line has an additional fee. 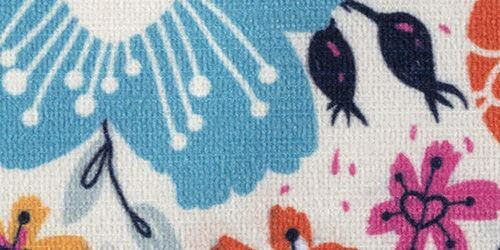 Do you print on fabric a customer supplies? Unfortunately not; we like to test meticulously so that we know what gets the best results on our fabrics, and our facilities cater perfectly to them. We do however print sublimation transfer paper to order, and if you have access to a heat press you can press your own fabrics easily. Should I save my file as a TIFF or JPEG? For multi-coloured or very detailed files we recommend using a tiff format, but they must be flattened. For simple colors and low detail files, a jpeg is fine. What is the situation with material shrinkage? Just like many fabric printing processes, there is the potential for shrinkage. Depending on the fabric, please expect and allow between 2-8% shrinkage which you need to plan for in your dimensions. 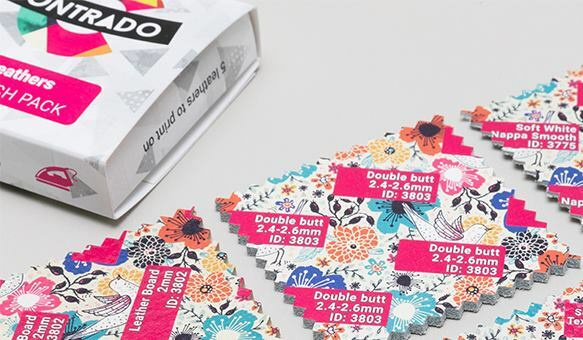 This percentage can vary from print run to print run and between fabrics, so we would advise to order a little more material than you require for your project. Can I print on both sides of the fabric? 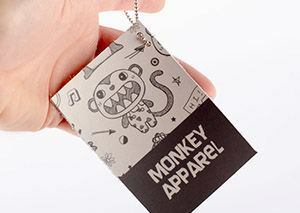 We do not offer printing on both sides of the fabric, as a lot of our fabrics are semi-transparent. 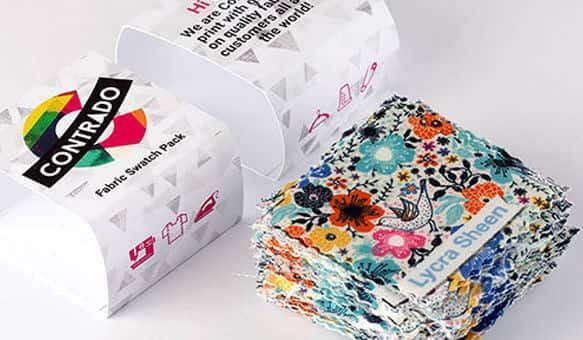 As the customer, you can consider the effect of printing on both sides one of our fabrics and contact us, and we will get back to you if it's feasible. Can I order labels in another fabric? Will you cut them like you do with the normal fabric labels? At the moment no, our labels are all printed on the same satin fabric. We may introduce more in the future, but for now, this is the best choice. The labels are all cut the same way. 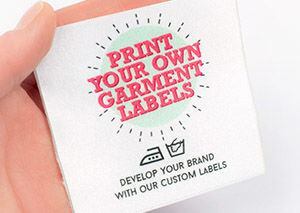 You can order the fabric of your choice and make the labels yourself, but we do not cut different fabric into label format. 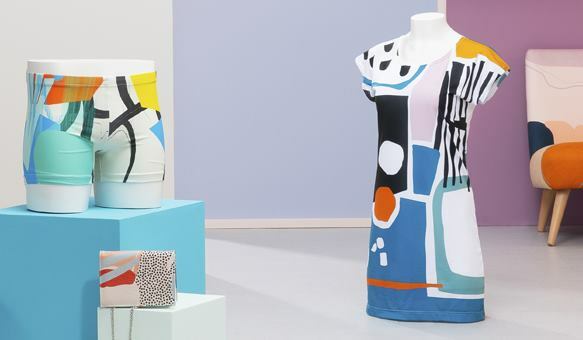 How is your fabric printing eco-friendly? 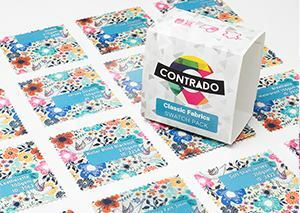 With environmental consciousness in mind, our fabrics are all printed using completely water-based inks. This means no chemicals or solvents are used. Our heat fixing procedure fixes the colors and prints, avoiding the downsides of steaming, such as excess or contaminated water returning into the waste system. We have one facility where we conduct all the printing, production and fulfillment. All of these measurements are approximate and can vary. Including with shrinkage, it can mean a fairly significant difference to ordered dimensions, so please plan your print accordingly. Depending on how open the weave is, our fabric can shrink anywhere from 2% to 8% with the average being 2.5%. How Would you Like the Edge? As it comes. We cut around your image, leaving a simply scissor cut, perhaps uneven white fabric border. Hem with thread. We can hem your fabric with a choice of black or white thread. Please allow 1-2 days additional production time. See below for information on how hemming affects the size of your print. We offer an overlock hem, as well as a folded hem (one or two fold depending on the fabric) however not all fabrics, are suited to both hem types. If you can see both options, it means both are suitable, and you will be able to choose whichever you prefer. Cut on the line. We will cut neatly on the edge of your design. This means that if you have a border around your design we will cut around that border, if your design takes the whole space of the fabric, then we will neatly cut around the edge of that image. Please be aware, when we cut along the line, we have to cut against the grain of the fabric. This is the standard procedure for fabric cutting. This means that with some fabrics, for example, Georgette and Mulmul, which have a slight wave in them, some fraying will occur. This is unavoidable, as the cut follows the grain of the textile. All of our fabrics are cut manually by hand, with the utmost care and attention. If your fabric has a slightly uneven look on the edges or a touch of fraying, this does not indicate a flaw in the textile. It is not always possible to achieve a perfectly straight cut with certain fabrics, so please do bare this in mind when it comes to your design. If you have any queries or would like to know about our cutting methods in more detail, please get in touch and we will be more than happy to discuss them with you. Please note: As we make everything by hand, all sizes may vary slightly. For further information about our fabrics see our FAQs. At Contrado, we personally commit to our customer satisfaction with a wide product selection hand-made in our premises, a great quality, dedicated service as well as fast delivery. For the past 15 years, we have printed and hand-made countless personalized products for a wide range of customers all over the world and many of them have become loyal customers who love not only our products but also the care, knowledge and dedication from our staff. Here is how it works. We first hand-make your item on average within 1-3 days depending on the product manufacturing timeline and quantities. After production time, we ship your order so you can receive it very quickly, subject to the delivery type you select in your basket. You can then enjoy or resell your handmade products with your very own designs. You can also read more about our terms & conditions and refund policy. We hope to start working with you soon. Because, we’re your BIGGEST fans.